Today we put up a gigabit hotspot at EATS restaurant at 6th & Fireside Ct. in Lawrence. EATS is inside the Miller Mart where Basil Cafe used to be before they moved to 9th St. The site has both a 802.11ac hotspot and a wired wall port for you to plug your laptop into. The speedtest below is from the 802.11ac WiFi hotspot. 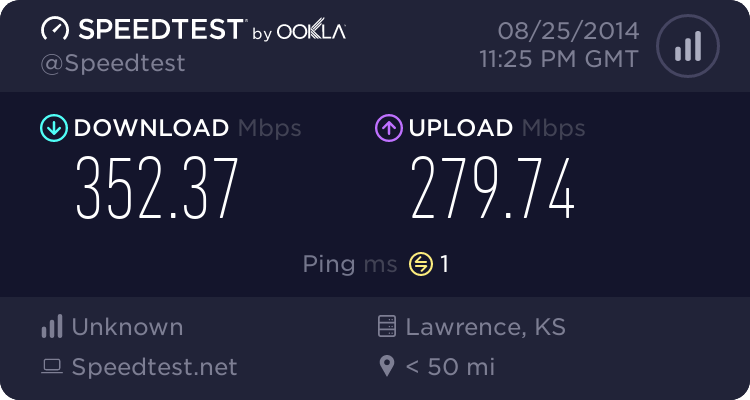 If you think Internet service like this would benefit your business or give you an edge while gaming at home, please join us at City Hall on September 9 at 6:30 PM to let your elected officials know. Try a Gigabit for Yourself!